Let me say this right up front: you're going to want to get this. 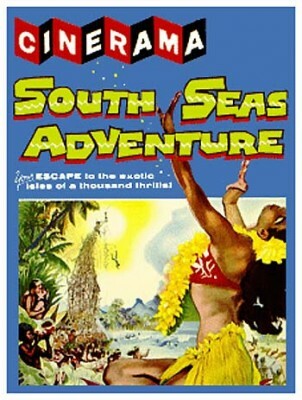 Cinerama South Seas Adventure (1958) was the last of the 1950s Cinerama films, movies never shown on television nor, until now, released to home video. In the case of Cinerama South Seas Adventure, it doesn't seem to have been shown publicly at all after the early 1960s, more than a half-century ago. Restoring these once hugely-popular but virtually lost films has been a personal crusade of many film buffs, historians, and preservationists, but it took the tenacity and ingenuity of Cinerama reconstructionist David Strohmaier to get the job done, aided by innumerable craftsmen and technicians. Via distributor Flicker Alley, the first two Cinerama Blu-ray releases, This Is Cinerama (1952) and Windjammer (1958) were issued last year to much deserved acclaim. These discs were beautifully packaged, compromised only by the lesser elements available: 70mm film. These next two releases, Cinerama South Seas Adventure and Cinerama Holiday (1955) have gone back to the original three-strip, six-perf high original camera negatives, replacing unusable bits and pieces with three-strip material deposited with the Library of Congress. The results are, in a word, glorious, and Strohmaier's exacting recreation of the original road show experience comes as close as possible to replicating the Cinerama experience. It's still not quite true Cinerama: a large, deeply curved screen is essential in order to experience the "audience-participation" effects of the process, but it's darn close. Further, the Blu-ray (a DVD version of the film is also included, but you'll definitely not want to watch the film in that format) comes with many invaluable extra features including, appropriately, a reproduction of the original theater program (which for decades after Cinerama South Seas Adventure disappeared turned up in used book shops around the world) and a delightful, extremely rare Cinerama short subject, Renault Dauphine (1959). The Cinerama process, in its original form, spurred the modern widescreen revolution of the 1950s, leading not only the dissemination of widescreen processes like CinemaScope, Panavision, Todd-AO, and VistaVision and the use of high fidelity stereophonic surround, but also the widespread use of color and the practice of shooting movies in far-off locations and away from Hollywood's backlots. But Cinerama was also unique, both technically and aesthetically. The process used three modified, synchronized 35mm cameras during production and three projectors during exhibition to produce an extraordinarily wide, wraparound image on screens curved at 146-degrees. The effect is often likened to the present-day IMAX process, but Cinerama was much more than a large, super-sharp image with outstanding directional sound. Because Cinerama's cameras used short lenses approximating the human field of vision the impact was extraordinarily, disorientingly lifelike. "Cinerama puts YOU in the picture" said the ads, and particularly when the camera was in motion, most famously aboard the rollercoaster that opens This Is Cinerama, audiences held onto their seats. Watching the Cinerama films today, the effect is almost like stepping through a time portal back to the 1950s. This is more obvious in Cinerama Holiday in sequences filmed on location in a burgeoning Las Vegas and Bourbon Street in New Orleans. Where old newsreels and other documentary films of these places merely recorded what they were like, Cinerama is like a time machine that transports the viewer to vicariously experience those places as they existed then. As Cinerama's camera had already visited much of the continental United States, Europe, Africa, the Middle East, and Asia, Cinerama South Seas Adventure travels to the then-U.S. Territory of Hawaii, Tahiti, Tonga, the Fiji Islands, the New Hebrides, New Zealand, and finally Australia. Produced by Carl Dudley, who lived in Tahiti himself for a time, the film presents a tropical fantasy mixing exotic and Western-influenced South Seas cultures so appealing they helped inspire travel to that part of the world for many years. Unlike This is Cinerama, which presented a series of unrelated vignettes, Cinerama Holiday, which follows two couples visiting the others' home continents, and Windjammer, which followed the young crew of the fully-rigged S/S Christian Radich on a single voyage across the Atlantic, Cinerama South Seas Adventure introduces a half-dozen characters on unrelated travels. The footage is sometimes staged, sometimes not. The film is partially narrated by Orson Welles. The movie opens with single girl Kay Johnson (actually Diane Beardmore) of Akron, Ohio, visiting Hawaii via the cruise ship SS Lurline, and eventually the film generates some suspense as to whether, per Hawaiian tradition, she'll move the flower she keeps in her left ear, meaning she's taken, to her right, indicating to the young suitor she's spending time with that she's now available. Next is Jean-Louis Martin (Igor Allan), a Frenchman anxious to reach Tahiti to pay tribute to Paul Gauguin and paint for himself. Amos Dorn (Ed Olsen), New England-born skipper of the 1930 German-built schooner Te Vega, sails further west to Tonga, the Fiji Islands, and the New Hebrides, visiting several native cultures, while in New Zealand World War II veteran Jim Perry (Jay Ashworth) explores that country's natural wonders (including Mt. Cook), sites he missed while in hospital there during the war. Finally, Stefan Koschek and his daughter, Anna (Hans Farkash and Janice Dinnen), having fled an implicitly Communist Eastern European country, arrive in Australia, their new home. After a tour of Sydney and Australia's other big cities the cameras follow them to the Australian outback, where they go to live on a remote farm with relatives. Unlike earlier Cinerama films and Windjammer (filmed in a rival process, Cinemiracle), Cinerama South Seas Adventure dispenses with the usual 1.37:1, black and white prologue, probably because by 1958 that format was all but extinct in American movie houses. Visually the movie is much more varied than the earliest Cinerama movies, with quicker cuts, a greater mix of locked-down and roaming camera shots, and even (gasp!) medium-tight shots occasionally. And, as David Strohmaier notes, this was the first Cinerama film to use optical dissolves rather than limit itself to straight cuts and fades. There's less audience participation effects with one notable exception. At an amusement park little Anna rides something called the "Dive Bomber," a kind of flight-simulator enthusiasts regard as the first "thrill-ride." Later on there's an amusing hopping-kangaroo-eye-view subjective camera angle. The scenery, of course, is positively gorgeous, and the flawless transfer brings out the best in everything. For this reviewer, I found myself less captivated by the beautiful sights than by the early footage aboard the SS Lurline. With that time portal effect described earlier, one really gets the sense of what travelling by cruise liner circa 1957-58 must have been like. Equally fascinating are the scenes in Hawaii, in the late fifties a place a lot more exotic and less touristy than it is now. Sydney, with its emblematic Opera House still 15 years away, looks like a different city altogether. Most of the fifties Cinerama movies extolled the virtues of Capitalism and Democracy and, visiting far-flung cultures, could at times be a little condescending and smug, but there's little of this here. Stefan and Anna's story is an obvious example, but it's not a hard sell, while the native cultures are treated with due respect. A pidgin English reading of The Lord's Prayer and an excerpt from Handel's Messiah performed by a Tongan choir likewise note, without really endorsing, the impact of Christian missionaries. Cinerama South Seas Adventure's transfer is impeccable. The image is exceedingly sharp with startlingly rich color. The Smilebox formatting approximates what 1958 audiences saw and suggests the audience-participation effects that wowed moviegoers then and which are still pretty impressive as presented here. (I found myself wishing I could have seen this via an HD projector on a really big screen.) Strohmaier's restoration (in which all parties involved are generously credited and highlighted) expertly minimizes the join lines between the three panels, matching the color while eliminating unsteady panels, blemishes and other issues. The full roadshow version is here, with the original film's overture, intermission break, entr'acte and exit music intact. The 5.1 STS-HD Master, adapted from the original 7-channel magnetic sound mix is extremely impressive, with loud blasts of the SS Lurline's horn and the crashing of waves really having the bassy oomph of today's modern audio. The disc is region-free. The supplements are terrific, headlined by the fully restored Renault Dauphine film, a six-minute short that's basically a car commercial showing off France's answer to the Volkswagen Beetle as it's built and tested at one of its plants. Also included is an informative audio commentary with Cinerama historian David Coles and actress Ramine Seaman (who plays Turia in the film), while Strohmaier is on hand to offer a brief but extremely interesting overview of the restoration process. The Wake of Captain Cook is a vintage, 23-minute behind-the-scenes film, and interviews with Carol Dudley Katzka, daughter of producer Dudley, and Cinerama production staffer Saul Cooper are a nice addition. Also included is a good Behind-the-Scenes slideshow, and the aforementioned 28-page full-color booklet is a terrific extra, perfect browsing material during the intermission. Cinerama South Seas Adventure was the last original Cinerama travelogue. U.S. Department of Justice restrictions on Stanley Warner Cinerama Corp. precluded the production of new films after 1958 and exhibition after 1960 (owing to the Supreme Court's "Paramount Decision" forbidding production-distribution-exhibition monopolies), and they sold off their interests in the format during this film's run. But it's a grand send-off and, more than a half-century since its release, Cinerama South Seas Adventure is a must-see and one of the best Blu-ray releases of the year. A DVD Talk Collector Series title.